Germanium can shield electromagnetic radiation. Titanium steel is durable and hard to deform or fade, keeping smooth and glossy. Material: Titanium Steel. Processing: Polishing. Making full use of the charm of bracelet, you can wear it whenever and wherever. Length : 21 cm Weight : 7 g / piece Package : 1 pieces anklet Note:pls allow a little bit manual measurement error,thanks, The colors may have some differences as the different displays,pls understand!. Bracelet, silver colored steel and pink coral, 7x4mm rectangle, 7-inch stretch. Coral is dyed and assembled. Elegant Swarovski Crystaldust Cuff White, Stainless Steel capped ends, Wristband. Crafted using our Crystal Rock technique, the irresistible Crystaldust Cuff is a new signature Swarovski design to equal Stardust and Slake. 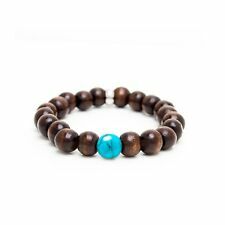 The brown wood with turquoise detail and a Stainl;ess Steel Ring provides a combination of warm yet cool feel to this casual, carefully handcrafted piece. This Stainless Steel Jewelry Is Hot! Perfect gift for a lady. Get it for the loved one, or treat yourself for a trendy bracelet style. This bracelet is 100% stainless steel. The bracelet showcases a modern rose gold-tone bangle design sparkling with white round CZ stones. Cubic Zirconia CZ. Fifteen years ago he started the Charles Hollander Collection producing prestigious objects made out of gold and diamonds. White and Yellow. Our quality is unsurpassed and all of our collections cater to the latest fashion trends. Feel royal while sporting this "royal" blue stretch bead bracelet from My Daily Styles. Complete with stainless steel Hamsa charm and silver accented beads, this Judaical jewelry gem will have you reaching for it occasion after occasion! This stainless steel jewelry will make a perfect gift for a lady. Give it to the loved one, or treat yourself for a trendy bracelet style. This bracelet is crafted of durable 100% stainless steel. The bangle bracelet features a modern yet classic design showcasing a rose gold-tone band sparkling with a glitter-like gilt and a row of white CZ stones. This stainless steel jewelry is a perfect gift for a lady. This bracelet is crafted from durable, highly polished, 100% stainless steel. Give it to the loved one, or treat yourself for a trendy bracelet style. This Stainless Steel Jewelry Is Hot! Perfect gift for a lady. Get it for the loved one, or treat yourself for a trendy bracelet style. This bracelet is 100% stainless steel. The bracelet showcases a modern rose gold-tone bangle design sparkling with a single row of white round CZ stones. Titanium steel is durable and hard to deform or fade, keeping smooth and glossy. Material: Titanium Steel. Making full use of the charm of bracelet, you can wear it whenever and wherever. Type: Bracelet. Bracelet made of crystal type chatons two vertices, usually with a coating which provides a special effect surface finish. Made of stainless steel, while at the ends decorated with crystals for maximum emphasize every woman's stylization. Swarovski bracelet Crystaldust is a consequence of the cult series Stardust. Fill your collection of bracelets with a total novelty and revolution in jewelry. NEW WITH WARRANTY CARD. Crafted using our Crystal Rock technique, the irresistible Crystaldust Cuff is a new signature Swarovski design to equal Stardust and Slake. Its open-shank silhouette is on-trend and comfortable, whilst the stainless steel capped ends, embellished with crystals, finish its clean design perfectly. A new signature design to equal Stardust and Slake, the irresistible Crystaldust Bangle is crafted using Swarovski’s Crystal Rock technique. Slip on to your arm for instant glamour or layer with others for a high-octane look.